After crossing the majestic main gate, take the pathways lined by lime trees leading to the castle, built in red brick and flint in the seventeenth century. Inside, the guide will lead you through the castle that still retains much of its original charm: living rooms, bedrooms, office in Louis XV style, and kitchens of the 19th century with brass, porcelain and earthenware. You will also discover, in the heart of the castle, doll museum, a remarkable collection of antique dolls, surrounded by their furniture. Outside, you can explore the castle cellars, chapel and laundry evoking historical lifestyle scenes of life in the past. And last but not least, will not fail to admire the french-style park and its lime trees of more than a hundred years old. The castle of Fleury-la-Forêt also welcomes you for one night or a whole stay, to discover château life in one of ours four guest rooms. 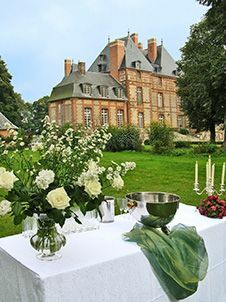 The castle is also a perfect place for organizing receptions (weddings, family celebrations ...). We invite you to a virtual visit that lets you discover the charm of the place.